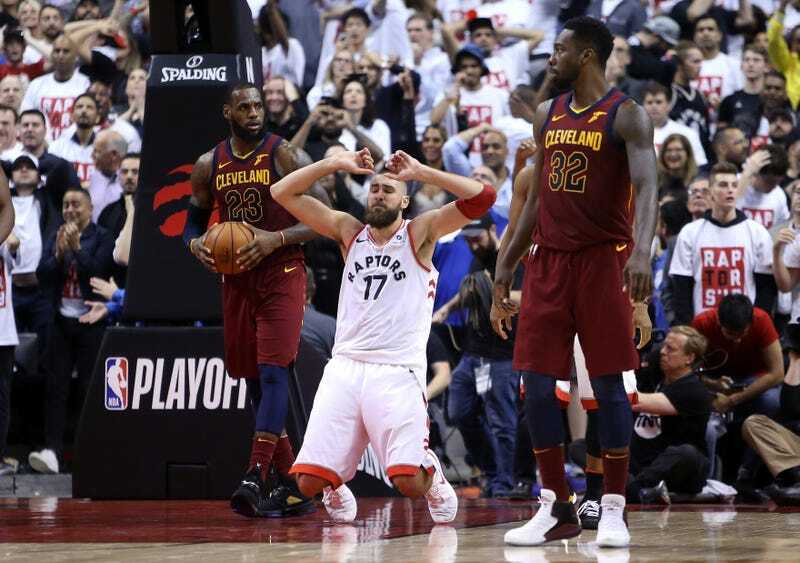 I’m not here to argue that the Raptors’ collapse in Game 1 of their second-round series against the Cavaliers is proof that their 59-win season was totally hollow and that they are in fact fraudulent pretenders unworthy of the No. 1 seed and should be expelled from the NBA so that no one ever again has to spend another second trying convince themselves that everything we’ve ever known about the Raptors is not true and that, actually, they are good this time. I am not saying any of that. Yet. I am simply here to say that last night’s game presented a breathtaking way to lose a basketball game. I honestly don’t know how they did it! Teams suffer heartbreaking losses in the playoffs all the time, and in most cases all they can do is throw their hands up and acknowledge that sometimes the ball just doesn’t bounce your way. But what makes this loss particularly galling, and so perfectly emblematic of this particular era of Raptors basketball, is that the ball did bounce their way many, many times. The Pacers had to deal with the one of the best versions of LeBron James we’ve ever seen. The Raptors were treated to a much rarer sight: a LeBron who couldn’t find his shot and whose flawless decision-making processor was in need of debugging. Here was LeBron James, carrying the worst supporting cast he’s had in a decade, faltering against the team he’s terrorized over and over again. It was a rare gift for the Raptors to receive, and if there was ever a time for them to begin the process of exorcising the demons LeBron has cursed them with, last night was it. Maybe they’ll get around to it in Game 2 and the rest of this series, but for now the Raptors are still the Raptors.